The term “21st Century student” or “21st Century Classroom” sure gets thrown around a lot. We’re so used to hearing and supporting our pedagogy with it, but have you ever stopped to think about what it really means? There are many qualities that make up a 21st Century student. In 1956, Benjamin Bloom headed a group of educational psychologists who developed a classification of levels of intellectual behavior important in learning. Notice that “remembering” although certainly a necessary component to learning, sits at the bottom of this pyramid to higher-level thought processes required for true learning to occur. Even with today’s emphasis on testing, it’s more important than ever to push our students to achieve higher level thinking. What are some ways that can be done today? First and foremost, parents/families must be involved in a positive way. Students must learn that their parents value their learning beyond the grades achieved on report cards. Parents who engage in competitive conversations regarding which schools their children attend, what page they are on, or what grades they received, might be better off focusing their energy on the learning outcomes of their child’s achievement or lack of. 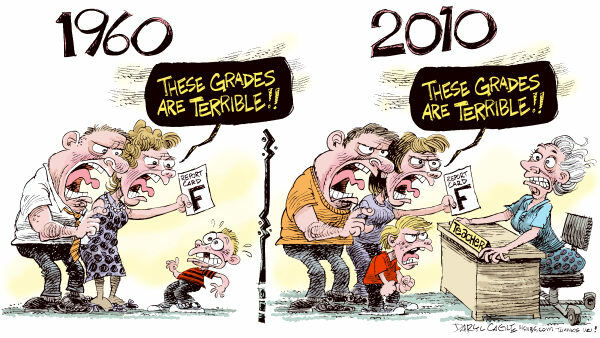 Even with a poor grade on a test or report card, for example, parents can ask, “What did you learn from this?” or “What can you/we do better next time?” rather than, “Why did you get this grade?” The cartoon below from Daryl Cagle had me wondering how I am supporting my own children through their educational journey. Understand and accept the fact that although it pains us (teachers) to reduce children to a grade or score, it’s currently how our system functions and there are many ways to deemphasize grades and focus on the whole child. Effective teachers are harnessing the Internet, specifically the power of blogging, to provide students with opportunities that simply weren’t available even a few years ago. I have my class blog and more importantly, my students have their own blogs where their writing brings them attention, global conversation and motivation for writing more effectively. Check out Lily’s post on bullying, Caroline’s post on Tourettes and Joey’s post on his Karate test. Don’t just read the posts, but also read the relevant and encouraging comments from readers, near and far. There are many, many more examples that you can explore. Scott McLeod’s compilation of exemplary blogs is a good place to start. So what does all of this mean for you, your classroom and your children? That’s what I’d like to hear from you.